Thanks to the Cleveland Museum of Art and the Cleveland Institute of Art Cinematheque, Christmas arrives early this year for local cineastes. This weekend, the latest works from two of the world’s greatest filmmakers (China’s Jia Zhang-ke and Russia’s Alexander Sokurov) receive their local premieres. If that’s not an occasion for Festivus revelry, I don’t know what is. 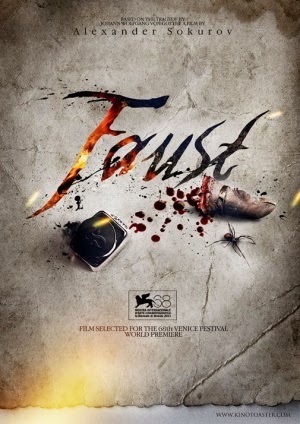 FAUST is the final entry in Sokurov’s extraordinary “Men of Power” series (Hitler, Lenin and Hirohito were his previous subjects) and finds the Russian master in a less austere, minimalist mode than usual for the heir apparent to the late Andrei Tarkovsky. At times, the near-hallucinatory imagery recalls maestro fabulist Terry Gilliam. The sad truth is that Sokurov will never become a household name in this country. After all, it’s not the 1960‘s anymore, a time when equally “difficult” auteur directors like Antonioni, Bergman and Resnais were the bread and butter of the American arthouse circuit. Sokurov’s rarefied, often sublime films remain, I suppose, an acquired taste. Here’s hoping more so-called cinema cognoscenti obtain it. 4 out of 4 stars.